The Newton nonprofit Stop Handgun Violence is looking for a new location for its billboard along the Turnpike. “This has been the proudest accomplishment of my life,” said John Rosenthal, a real estate developer who attached the billboard in 1995 to the side of a Lansdowne Street parking garage he owned. garage from Rosenthal in 2013. After 19 years, the Newton nonprofit Stop Handgun Violence is looking for a new location for its 252-foot-long billboard. Over nearly two decades, the billboard and its sponsor have attracted support from a broad coalition of gun-control activists, ranging from politicians to artists to families affected by gun violence. “I was hoping to be able to keep it where it is,” Rosenthal said. 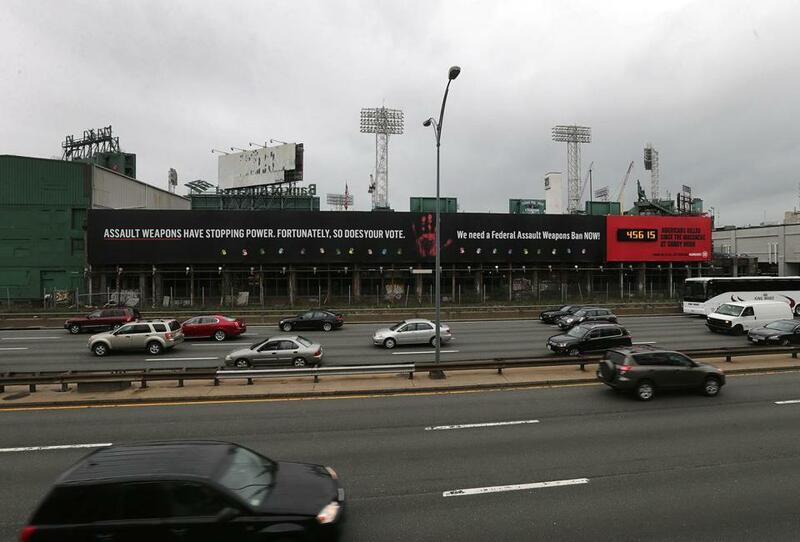 A spokeswoman for the Red Sox declined to comment on whether Fenway Sports Group, the team’s parent company, would be willing to discuss an extension for the sign on Lansdowne Street. She also declined to discuss the company’s plans for the site. Rosenthal is not required to pay rent for the billboard, but he estimated that the site could fetch more than $1 million a year for commercial advertising. The developer said that Fenway Center, a mixed-use project he plans to build nearby over the turnpike, might be an option for the billboard. However, he said, the sign cannot be moved there for at least three to four years because of construction, and its location atop the turnpike would not be as highly visible. Visibility is not an issue now. 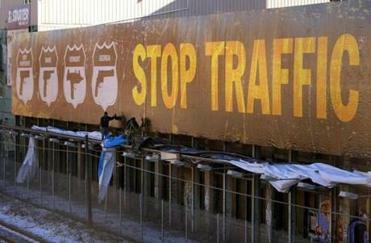 The billboard, which is passed by 150,000 vehicles a day, is intended to change minds with jolting, in-your-face messaging. The latest example is its tally of US gun deaths since the fatal shooting of 20 first-graders and six adults at the Sandy Hook Elementary School in Newtown, Conn., in December 2012. The display usually changes once a year with messages such as, “Welcome to Massachusetts. You’re more likely to live here.” Another design used piecemeal script usually associated with ransom notes: “We have your president & Congress,” in which it likens the National Rifle Association to a hostage-taker. For baseball fans walking to Fenway Park, the message is unavoidable. What some people call powerful, others call incendiary. “It’s a waste of time and money on a billboard that hasn’t solved any problems,” said Jim Wallace, executive director of the Gun Owners’ Action League, which is the Massachusetts affiliate of the National Rifle Association. “When he talks about the NRA buying Congress or banning assault weapons at gun shows because terrorists are buying them, I think they’re meant to be inflammatory and . . . don’t exactly seek to solve problems,” Wallace said. Gun advocates, Wallace among them, say tougher regulations do not result in fewer gun deaths. According to state data, the total number of firearm injuries — including assaults, accidents, deaths, and suicides recorded at a hospital — declined 42 percent from 1994 to 2011, according to the state Department of Public Health. After a stark drop from 1994 to 1998, however, the number has risen 17 percent. Rosenthal attributes the increase after 1998, in part, to cuts in federal funding for law enforcement under former president George W. Bush, who served from 2001 to 2009. Despite that rise in gun-related injuries, the state has the second-lowest rate of firearm deaths in the country, according to the federal Centers for Disease Control and Prevention. Don Law, the concert promoter and an early major donor to Stop Handgun Violence, said the billboard has played a big role in shaping the debate in Massachusetts, where a 1998 law toughened licensing requirements. The singer Bonnie Raitt, a longtime supporter of Rosenthal’s, said his effort has been effective. “The Massachusetts handgun campaign is the most inspiring and effective in the whole country,” Raitt said.